Investing in the stock market comes with a particular conundrum—investors are highly prone to selling a stock after observing a small price hike­­­ but continue to hold onto stocks even after observing a minor loss. In the first scenario, the investor may then see the stock prices soar even higher. In the latter scenario, unfortunately, the investor is likely to observe a drop in price that makes the loss even worse. 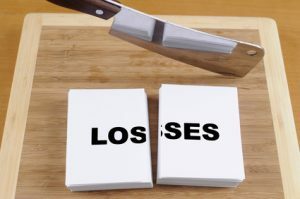 Learning to cut losses and move on is one of the fundamental skills new investors must learn. It’s not very easy to do, mostly because of how our brains are wired. We innately have a condition known as behavioral bias. This trait allows us to believe that we have not made a judgmental error, even if the evidence shows we have. That’s why a lot of investors hold onto losing stock. Say, for instance, that you have invested in a very promising set of penny stocks. One day, the value of these stocks drops. You may not want to sell your stocks right away, hoping that the price may naturally bounce back. This is your behavioral bias at work. To avoid this particular trap, calculate the percentage in value the stocks need to gain to recover the price. This recovery gain calculation will indicate whether you should cut your losses right now. The wider the recovery gain margin is, the less likely the stock value is going to bounce back up. If the recovery gain margin continues to widen, meaning the stock value keeps plummeting, then you need to take your emotions out of the equation and cut your losses. It can be difficult when you have high hopes for a particular sector, but let the numbers speak for themselves. Don’t let your feelings overrule logic. If you hold onto losing stock, it may devalue your entire investment portfolio. Herd mentality can get investors into all sorts of trouble. It can drive sensible investors to buy into scams. Herd mentality could also affect your judgment and ability to cut losses when needed. For example, you may be tempted to hold onto losing stock because all your friends or email list buddies are positive about the ultimate outcome. In the end, the loss would be entirely yours. Stocks that belong to companies of celebrity founders or CEOs may attract fandoms that continuously praise the entity, even when the market performance is bad. It’s unwise to listen to such emotionally-driven sentiments. Instead, look at the price charts and calculate the gain margin as mentioned above to cut your losses while you still can. One of the most compelling reasons why investors fail to cut losses relates to the inability to accept the fact that they have made a bad call. Don’t judge yourself too harshly. Even seasoned investors make mistakes. So if you made a bad call, own up to it. Don’t make excuses as to why you purchased the stock in the first place. No one can predict the future. Your judgment may have been a sound once, but if the stock prices are plummeting, then the fault is not your own, however, it will be, if you don’t step in and cut the losses. Don’t get emotional about the investments you make. When a stock or asset segment becomes impossible to “read,” you should probably sell it and move on. Use the above suggestions to bring yourself to cut the losses whenever needed.